Forget Drake vs Meek. Forget Mayeather vs Pac. The battle I want to see is between the two most exciting and popular pro-am leagues this summer: The Drew League and the Seattle Pro-Am. On Sunday, the Drew League wrapped up their season as James Harden and the LAUNFD team defeated the dynamic duo of Nick Young and DeMar DeRozan for the Drew League championship trophy. Meanwhile in Seattle, Jamal Crawford, Zach LaVine, Nate Robinson, Isaiah Thomas and other pros were putting on a show for basketball sick fans at the Seattle Pro-Am All-Star game. Then the Seattle Pro-Am issued an official challenge to the Drew with the dates of August 21, 28 and 29. The Drew League responded by saying the Seattle Pro-Am wasn’t “serious” and they have been trying to do this for a couple of years. Then the discussion went silent – at least publicly. I thought game over before the game even started or maybe the Drew crew was just too busy celebrating the premier of ‘Straight Outta Compton.’ But then late Wednesday night Jamal Crawford tweeted this message. 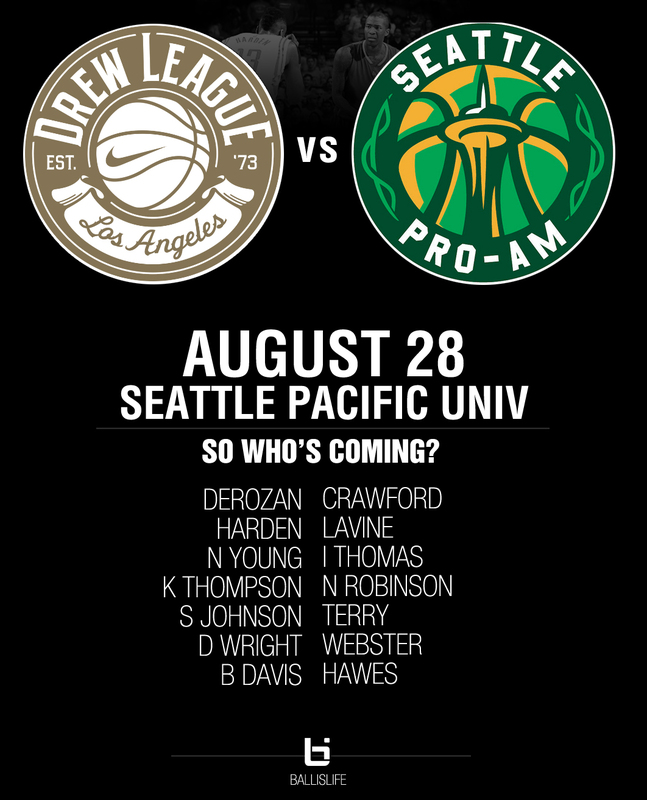 *BREAKING* U asked for it, and U shall receive it…@SeattleProAm vs @DrewLeague #whorunsthewest is going down!!!! AUG 28th #SPU!! Let’s go! Both league confirmed the event and date shortly after so it looks like the event is finally going down. You can read a timeline of all the messages between the players and league below but first let’s take a look at a few possible rosters for each team. Video highlights will follow the messages.